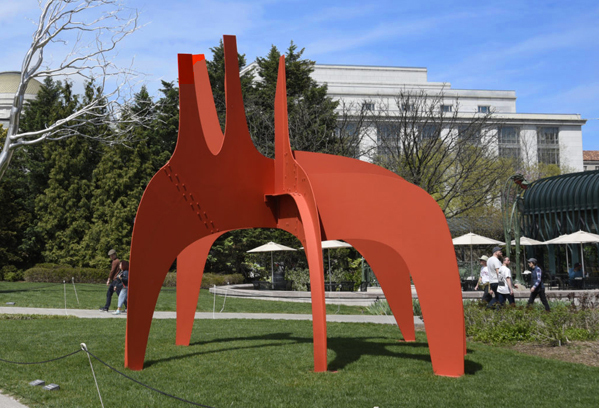 Alexander Calder’s Cheval Rouge (Red Horse) on display in the National Gallery of Art Sculpture Garden in Washington, D.C. Photo by Robert Alexander/Getty Images. Employees of federal museums are looking for part-time work, anxiously checking their bank balances, and fretting about what’s to come. If a government shutdown falls on federally-funded cultural institutions and furloughed employees are prohibited from checking work email and discussing their predicaments publicly, does that shutdown make a sound? As the partial US government shutdown is poised to enter its fourth week, all federal museums, including the National Gallery of Art and 19 Smithsonian museums, remain closed. An estimated 800,000 employees have missed their most recent paycheck. But the true impact of the shutdown—the longest in US history—remains opaque. Due to the Hatch Act, which prohibits many federal employees from engaging in political activity, workers—including those in the arts—have been instructed to remain silent. Many furloughed employees from Washington museums and cultural institutions declined to speak even anonymously with artnet News. But a few described a tension- and anxiety-filled few weeks. “We have no idea what Trump is going to do,” one National Archives employee told artnet News. After two short shutdowns last year, she and and her colleagues felt it was only a matter of time before there’d be a substantial one. But “I certainly didn’t think it would be this long,” she said. “You don’t expect they would shut you down over Christmas. The optics of that are ridiculous.” Government employees had to buy presents for family and friends while they weren’t receiving paychecks. “People just end up in the hole right away,” she said. The National Archives employee counts herself lucky, with savings that can cushion her for a few months, but she hesitated to make a few big purchases before the shutdown, unsure if she’d be furloughed. She is worried for more junior employees with less savings and high rent. The archives employee hasn’t yet applied for unemployment, which is a hassle, only returns pennies on the dollar for many salaries, and must be repaid following receipt of the back pay. But she keeps telling herself she will do it, after three weeks, after four weeks.